At A Perfect Wedding we handle all the details for you, from beginning to end, so you can simply enjoy yourself while you entertain your guests. We look forward to working with you on every detail to make your Special Day a beautiful and memorable occasion. 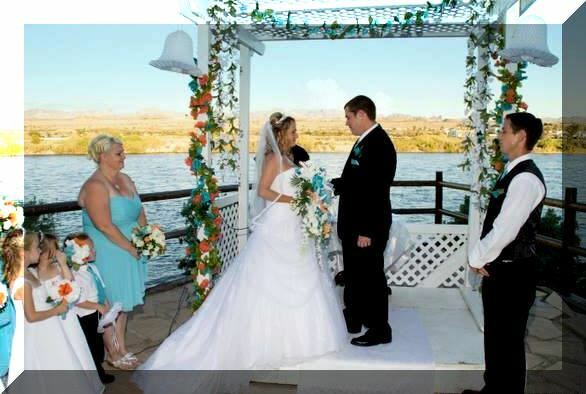 We have the perfect location Overlooking the Majestic Colorado River, The Pointe which can seat up to 200 guests. Beautiful Gazebo overlooking the Colorado River. You will find breathtaking backdrops for the cherished photos of your wedding. It is our belief that having a FANTASTIC Wedding and Reception should not have to break the bank! Just one call and we do it all inclusive. Come, relax and enjoy your family and friends. We will take care of the rest. "The River Walk Gazebo" overlooking the Colorado River . $375.00 includes: Gazebo, Minister and Wedding Ceremony. Maximum of 11 people standing outside & 4 inside Gazebo No Music, No seating available at this location. Indoor Wedding Chapel for 30 minutes. White Lattice Wedding Arch with Ivy Garland, White isle Runner (not shown), Bottle of Sparkling Wine or Cider, Bride & Groom Toasting Glasses, Wedding March, Background Music and Minister. $550.00 up to 25 people, $650.00 up to 50 people $5.00 per person after 50 people. At BRIO, food and celebration go hand-in-hand. Our Chefs have hand selected a variety of their Italian favorites from which to choose. Our two beautifully-appointed private dining rooms can seat up to 84 guests. We look forward to helping you host an event that will be remembered for all the right reasons. We'll do the planning, you do the impressing!